A lecture series examining issues related to cultural competency launched last year by Lawrence University returns Thursday, Sept. 21 with the opening program of the 2017-18 academic year. Erin Buenzli, Lawrence’s director of wellness and recreation, presents “A Community of Self-Care” at 11:30 a.m. in the Esch-Hurvis Room of the Warch Campus Center. The program is free and open to the public. Underscoring the importance of taking care of ourselves as well as others for the betterment of the campus community and society, Buenzli, will discuss campus resources available for creating an inclusive wellness culture where each person’s unique needs are recognized and nurtured in their individual pursuit of wellness. She also will examine ways each members of the Lawrence community can take part in the shared responsibility of creating a culture of compassion, empathy and self-care. The cultural competency lecture series is sponsored by the Office of Diversity and Inclusion. Lawrence University’s commitment to the health and well being of its employees has earned it a Gold Well Workplace Award from the Wellness Council of America (WELCOA) in conjunction with the Wellness Council of Wisconsin. The Gold Well Workplaces Award recognizes organizations that have successfully built comprehensive worksite wellness initiatives and are demonstrating concrete results. WELCOA’s Well Workplace awards are based on a criteria of seven “Cs”: Capturing CEO support; Creating a cohesive wellness team; Collecting data to drive health efforts; Carefully crafting an operating plan; Choosing appropriate interventions; Creating a supportive environment; and Carefully evaluating outcomes. 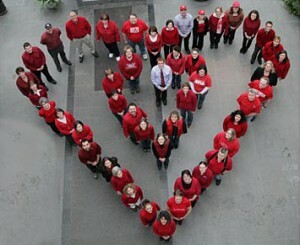 Lawrence is committed to being aware of health-related issues regarding the heart. • Healthy Eating/Weight Management. A competition for teams of three people was held from Nov. 13 to Jan. 9 to encourage participants to maintain or lose weight during the holidays. The competition attracted 60 participants (20 teams of three), with 18 teams completing the program. – Total weight lost for all teams was 201 lbs., a 2.2 percent decrease, with one team losing a competition-best 5.72 percent of its combined weight. • Stress Management. Lawrence partnered with local masseuses to provide on-campus 30- and 60-minute massages in the Wellness Center at reduced costs to participants to promote stress management, relaxation and work/life balance opportunities. Post-massage questionnaire comments indicated the program superseded expectations and participants recommended it to their colleagues. • Tobacco. In conjunction with the Lawrence University Community Council, plans were approved for an entirely smoke-free campus with the exception of only two designated outdoor smoking areas, one on each end of campus, strategically located away from high-traffic areas. The wellness committee has not received any complaints or concerns since the policy was implemented. 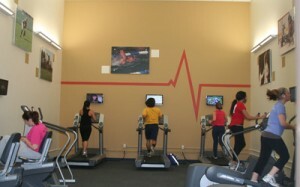 The Lawrence Wellness Center provides numerous workout options. • Physical Activity. In addition to free access to the on-campus wellness center and its pool, gymnasium, cardio equipment, weights, a running track and locker rooms, an on-campus fitness program features yoga, pilates, zumba, a noon walking group and intramural sports, among others, all at no cost to employees. Athletic training services also were available. Average faculty/staff usage increased from 551 visits per month from January-May 2011 to 620 visits per month in January-May 2012. • Medical Self-Care. Campus-wide QPR (Question-Persuade-Refer) training on suicide awareness was offered to all faculty, staff and students. The “Lawrence Lifeline” program certified individuals as QPR gatekeepers on campus who were trained to identify and initiate discussions with others who might be having thoughts of suicide. More than 90 percent of participants reported increased knowledge of suicide and its prevention and more than 80 percent of participants reported enhanced confidence in incorporating that knowledge into interactions with students. Since WELCOA’s inception in 1991, more than 1,000 organizations in both the non-profit and profit sectors have joined the list of “America’s Healthiest Companies” by earning the Well Workplace Award. “Lawrence University worked hard to successfully meet the rigorous standards set by the Well Workplace process. It is our pleasure to recognize them as the newest Wisconsin employer to achieve Well Workplace status” said Jessica Raddemann, executive director of the Wellness Council of Wisconsin. Lawrence will host the annual Fox Cities Well Workplace awards ceremony Oct. 29 from 4:30-8 p.m. in the Warch Campus Center. An announcement regarding the status of the Fox Cities as a “Well City USA” will be made that evening. Achieving a Well City designation requires that 20 percent of a community’s entire working population must be employed by at least 20 Well Workplace award-winning organizations. Only a road trip to a local nature center to pick up some duckweed for a biology class that required the use of her car prevented assistant laboratory supervisor JoAnn Stamm from biking to work every day this summer. Stamm’s dedication helped Lawrence University edge Ripon College to finish first among 111 colleges and universities nationally in the small-colleges division (less than 3,000 students) in the recently completed first National Bike Challenge. Led by Stamm’s team-high 1,108 miles, Lawrence’s 27 faculty and staff riders logged 6,270 miles during the challenge that ran from May 1 to August 31. One point was awarded for each mile ridden with 20 points awarded to each rider for each day they biked. Lawrence finished with a total of 21,505 points, edging Ripon College, which had led the challenge most of the summer, by just 279 points. Out of 9,578 workplaces nationally who participated in the bike challenge, Lawrence placed 124th. 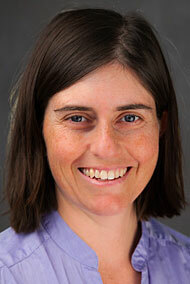 Avid biker JoAnn Stamm helped Lawrence University win the small college division of the first National Bike Challenge. 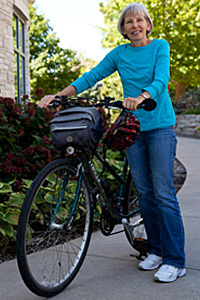 For the past several years, Stamm has averaged about 1,500 miles a year on her bike, but is hoping to top the 2,000-mile mark in 2012. Patty Leiker, Lawrence’s employee wellness coordinator, said she was thrilled when the final standings were posted and Lawrence finished first in the nation in its category. Lawrence will be recognized Thursday, Sept. 27 for its winning performance by the City of Appleton’s Trail Advisory Committee and Andy Clark and Elizabeth Kiker, president and vice president, respectively, of the League of American Bicyclists. The city of Appleton also participated in the challenge, placing second nationally in the “communities” category. The awards presentation will be part of a public forum — “Making Appleton More Bicycle Friendly” — hosted by Lawrence at the Warch Campus Center Cinema from 6-7 p.m.
Kimberly-Clark Corporation organized the National Bike Challenge in partnership with the League of American Bicyclists, Bikes Belong and Endomondo, a mobile-based sports and fitness tracking community, as a way to promote bike ridership for both transportation and recreation purposes. The entire challenge generated 12,094,591 miles ridden, surpassing its overall goal of 10 million miles. Sixty-three percent of Lawrence’s collective 6,270 miles were logged for transportation purposes, saving an estimated 5,740 pounds of carbon dioxide emissions.